Twelve-year-old Sif is goddess of the harvest, with her abilities woven into her long, blonde hair. She also has special prophetic powers—she is a seer—but is reluctant to share them after a mishap years ago caused a big rift in a friendship that meant a lot to her. And Sif is determined to not let that happen again! But when the mischievous Loki cuts her hair in a horrible prank gone wrong, Sif orders Loki to fix it. Without her hair, the crops in the land of Midgard—which supplies the wheat for food in Asgard Academy as well—are in danger of dying off. With Sif and Freya, Loki goes to ask for help from the dwarfs, specifically, the sons of Ivaldi who are all skilled blacksmiths and strikes a bargain with them. They hammer and spin gold into fine golden strands along with a spear and a ship that will grow to full size once in water. On his way back through the cave, Loki gets an idea for how to get more treasures by playing one set of dwarfs off against another. Envious of the work of the sons of Ivaldi, the dwarfs Brokk and Eitri say they can do better. Loki replies that he doesn’t think they can and that, furthermore, he’ll stake his head on it. Is that a bet that Loki will regret? And will Sif be able to restore her magical powers to prevent the drought in Midgard? The first book in a brand-new series steeped in Norse mythology, magic, adventure, and friendship. When eleven-year-old Freya hears that prophecy from her magical jewel, she isn’t sure what to make of it. Doomsday? She will find the key? Mere seconds after that prediction, she receives a mysterious invitation to Asgaard Academy from the powerful Odin, who commands her to “bring her magic” to Asgard. With encouragement from her twin, Frey, Freya reluctantly heads out on their new adventure. And Freya’s first challenge begins before she even steps foot in Asgard. 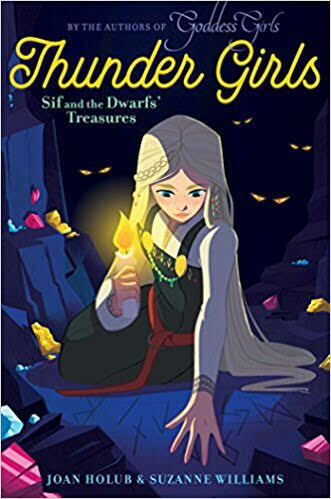 While trying to navigate the treacherous Bifrost Bridge, she drops her magical jewel off the bridge, and a sneaky pair of dwarves take her jewel down to the world of Midgard! Without that jewel, Freya thinks she is powerless. 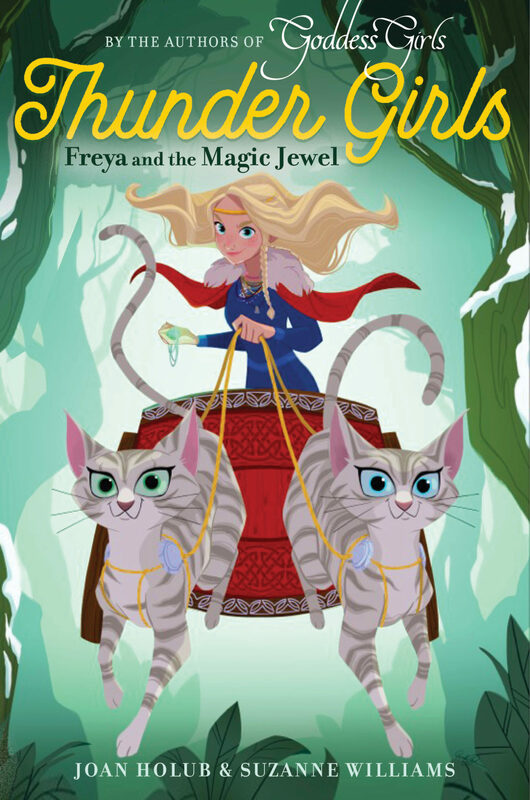 But with the help of her pod-mates at Asgaard, Freya discovers a world that is bigger and more mysterious that she ever imagined! There, she learns the true terror that Ragnarok—the doomsday her jewel warned her about—could mean for Asgard Academy if she and her new friends, the Thunder Girls, don’t stop it!